All the best meals are composed by a committee of chefs, analysts and marketing specialists who crunch numbers and sample spices in the name of a delicious meal. 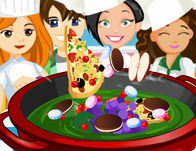 Take a taste of this yummy pizza, chocolate stew. It's what everybody wants.